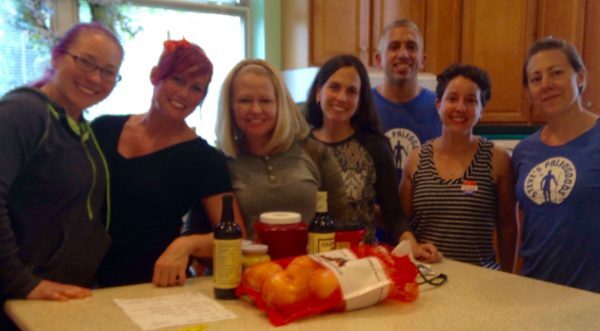 Yesterday my Steve’s PaleoGoods team visited our local Ronald McDonald House to prepare breakfast and dinner for 50 families. They had traveled from all over the world to receive world-class treatment at Children’s Hospital of Philadelphia and Cooper Medical Center. Fortunately many of the children do not require hospitalization, but rather just a place to stay while they receive treatment. 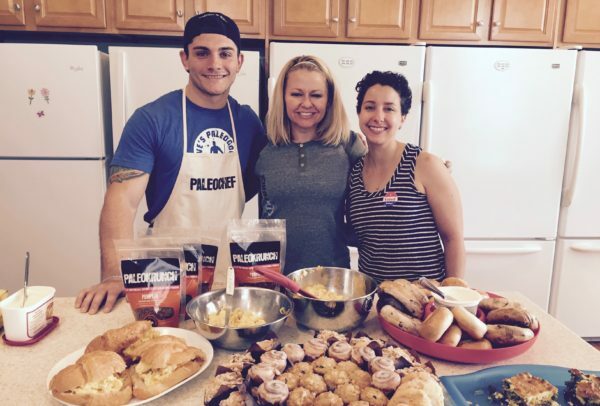 It’s an amazing home away from home, and it was truly an honor to cook and serve the families. Their smiles and gratitude were heartwarming. We made friends with parents and children who did not speak English. The gratitude and comfort that a home-cooked meal provides is a universal language. Each family gets their own cabinet in the kitchen for snacks. 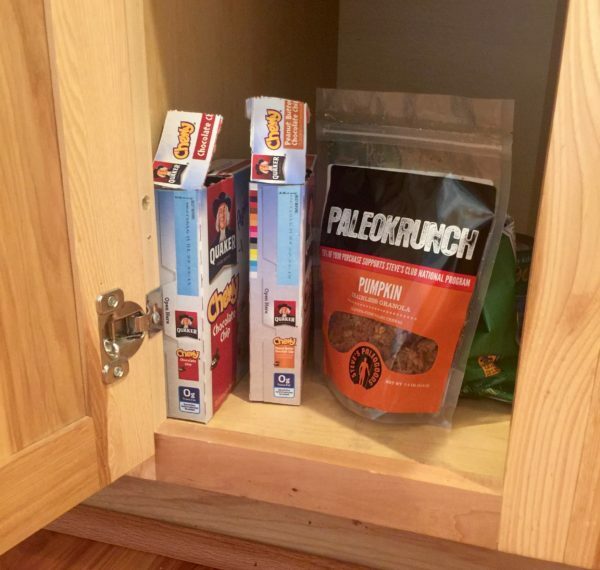 They were excited to add PaleoKrunch to the pantry. Through rudimentary sign language, we were able to explain to a family from China whose beautiful 4-year old daughter was battling cancer that mac and cheese to Americans was kind of like white rice to the Chinese. They understood and bowed as we all laughed. That’s what impacted me the most, the laughter and unwavering positivity of the families potentially facing the absolute worst. You could actually see the love and support they provided to each other as they piled the plates and shared a meal together. We listened as they asked each other for updates on their children, in a painful kinship that I can not begin to fathom. “That’s what we are here for, to support each other,” one Mom told me whose gorgeous baby boy was kicking and cooing despite having logged 10 hours in the hospital that day. Everett appeared to be a healthy happy baby, no doubt in part to the love and care his parents provide as the three-month old unknowingly fights for his life. Since 1983, the Ronald McDonald House in Camden, NJ, has served families whose children are being treated at nearby hospitals for critical illness or traumatic injuries. It’s just one of nearly 300 locations in 30 countries around the world. Our local house has hosted nearly 20,000 families over the last three decades, allowing these brave parents to focus on helping their children heal rather than worrying about costly travel and restaurant meals. “Most of our parents gain the freshman fifteen thanks to the wonderful volunteers who prepare delicious meals,” joked Teddy Thomas, the president of our local chapter. It was quite obvious that Teddy provided much of the leadership and gas that makes “her house” GO. Her hard-working team was also buzzing about, making sure we had the tools we needed while incessantly thanking us for our service. In between a busy day of what I can only guess includes fundraising, donor relations, house maintenance, board communication and team management, Teddy was not too busy to make ice tea for the kids at dinner. She joined us in the kitchen and gave us a tour of the beautiful facility. Each room was themed and professionally decorated. Many of the television and recreational areas also boast climbing play yards for the kids and toys galore. Companies, Foundations and even families “adopt” the areas and are responsible for designing, decorating and maintaining the rooms. The leather lazy boy furniture was lush and the common areas were warm and inviting. I asked Teddy if there was ever debate about what programs to watch. While my food company has very little in common with the largest restaurant chain in the world, I found a strange commonality with our common missions to DO GOOD through a non-profit network. We are tiny in comparison, as the Steve’s Club National Program has 30 Local Clubs while the McDonald’s network has a presence in 30 countries around the globe. But the infrastructure provided by the fast food giant and their ability to replicate a beautiful mission around the globe was very inspirational for my team as we return to our day to day work. Everett’s Mom was right. That’s exactly what we are here for. To support each other.